Yukon Scout 30x50 Collapsible Spotting Scocpe is a testament to Yukon 's ability to provide unique, high quality spotting scopes at affordable prices. 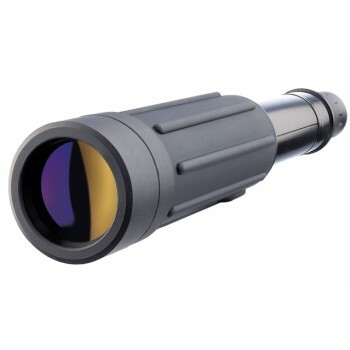 Yukon has constructed a spotting scope that compliments 30x magnification with practical, ergonomic design. The most distinctive features of this Yukon Spotting Scope are its collapsible body and large 50mm objective lens. The Yukon Scout 30x 50mm Spotting Scope 's body can be retracted inward, reducing scope size, making it perfect for travel. The considerable surface area of the Yukon Scout Spotting Scope 's 50 mm objective lens provides immense light gathering capability, producing high resolution in a variety of lighting situations. Yukon 's special multi-layered magnesium fluoride coating contributes to the sharp imaging. Encased in durable, water resistant, rubber armor, Yukon Scout Spotting Scope 30x50mm can withstand rigorous use and can be used for both hand held and tripod use. The Scout spotting scope is a high power optical device which allows the user to conduct detailed observation at long distance. For prolonged observation the use of a tripod is recommended. The scopes are outfitted with a ¼ inch mount to be installed on a tripod. The Scout spotting scopes are outfitted with a mechanical orientation cue on the housing for tentative aiming (especially for using on tripod). After preliminary guidance, the position of the scope is fixed, and further guidance is made with fine adjustment tripod screws. The body of the Scout scope is rubber-armored and water-resistant. Rugged body coating guarantees secure grip for hand-held use. Scout is a telescopic spotting scope so it collapses to a very portable 230 mm in length. Thanks to its compact size and light weight, one can carry it conveniently on a waist belt.